Okay, this game isn't really educational, but you could use it to introduce Interactive Whiteboard skills to your students! Your students will need to teach the dog to do some tricks for the dog show. Use the mouse (or practice touching the Smartboard or using an ActivPen) to draw the command shown on the sign above the dog's head. When you draw the command correctly, the dog practices his tricks. 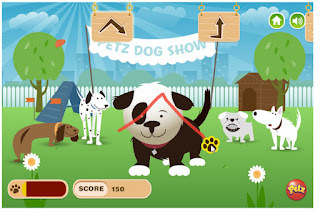 The Petz Dog Tricks game is on the ASPCA Kid's Site. What fun! It may not be educational but I can envision students playing with it during an indoor recess day time! Actually, I am sure that there are some good motor skills being built with this game for young students.